Times Square today is bright and crowded - a tourist mecca, entertainment district, retail powerhouse, and pedestrianized precinct that matches in vitality, both economic and populist, any decade of its storied past. But thirty years ago, the future of Times Square was in limbo - caught between a series of false starts at clean-slate urban renewal by the City and State and an emerging philosophy of urbanism that favored history, preservationist values, electric signs and semiotics, and delirious diversity. Times Square c. 1990. Photograph: Carol M. Highsmith. Library of Congress. 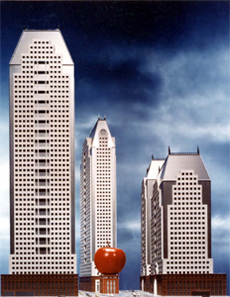 A model of the John Burgee Architects with Philip Johnson and Venturi, Rauch & Scott Brown proposal for Park Tower Realty in 1984. In 1984, in particular, the past and the future of Times Square collided at a pivotal moment when proposals to build a matched set of four mega-skyscrapers on the corner sites of the crossing of Broadway, Seventh Avenue and 42nd Street elicited howls of protest. City-supported plans even called for the demolition the 1904 Times Tower, which had given name to the square. An alternative "ideas competition" for that site, organized by the Municipal Art Society and the NEA, drew more than 500 entrants, and the resulting exhibition of winners attracted widespread press attention. The current exhibition reassembles twenty of the drawings of the juried competition, which represent a cacophony of architectural directions, from poetic musings, to irreverent one-liners, to theory-driven manifestos. Other community-organizing efforts by the MAS, architects, and diverse advocates altered the trajectory of establishment plans, both for Times Square and in the new zoning regulations that had recently been put in place to incentivize high-rise development in West Midtown. Preserving the historic theaters, maintaining the bright lights of Broadway, and protecting the openness of the area's central "bowl of light" by setbacks at the street level and mandated acres of colorful electric signage were goals achieved by widespread civic engagement. 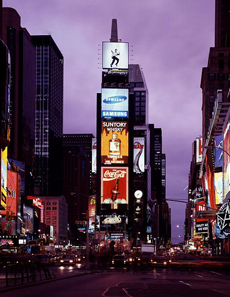 The Times Square of today with its costumed corporate towers and high-rise hotels, though designed and constructed in the 1990s and the new millennium, had their genetic code written in the 1980s. 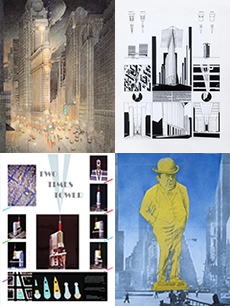 Images in the banner and the group of four represent individual entries to the MAS Times Square Site Competition of 1984. The individual artists or teams are listed here in brief and in full IDs in the virtual exhibit.